The Bushpig is a strong and stout species of pig family, commonly found in Southern and Eastern Africa. 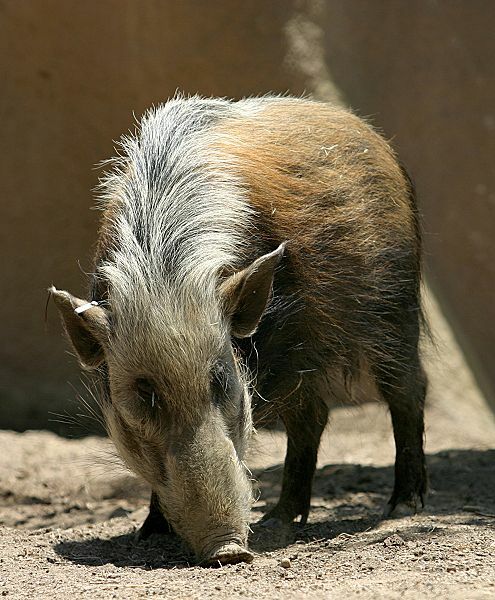 They are closely associated to the red river hog, another pig species that is also found in Africa. The Bushpigs form an important part of the African ecosystem. Although they are known to be wild and aggressive, they generally make good pets. Despite being preyed on by other animal species and humans their population have been pretty steady and constant, primarily due to their high reproductive rate. Size: Adult Bushpigs reach a shoulder height between 66 cm and 100 cm. The females are smaller in size than the males. 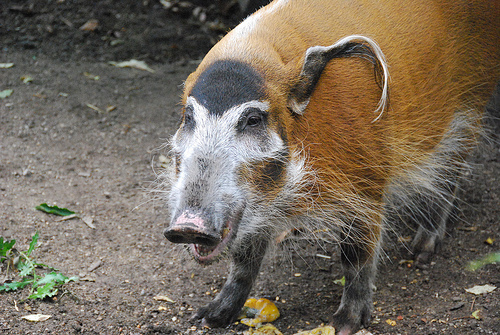 Weight: Young Bushpigs weigh around 50 kg. The adults weigh up to 150 kg. Tusks: Their tusks are quite short in size and very sharp. The upper tusks are hardly visible. The lower ones tend to grow up till 7 centimeters in length. Body: Bushpigs have round bodies that resemble domestic pigs. Their signature marks for identification are the small eyes, pointed ears, muscular snouts and buckled toes. The body is almost entirely covered with shaggy hairs. Both male and female Bushpigs have mane, which bristles when they become restless and agitated. Color: The color of their body varies between dark brown and reddish-brown, gradually growing darker with their maturity. Their mane is of a lighter coloration compared to the rest of the body. The upper portions of the face and the ears are also lightly colored. The young Bushpigs are covered with yellow-brown stripes when they are born, that gradually disappear. Tail: The length of their tail is about 12 inches to 17 inches. The tip of the long tail is tufted. While running, Bushpigs keep their tails down. Legs: Their legs are relatively short compared to the whole body. Sexual dimorphism: The male Bushpigs are characterized by having a bony ridge. They also have their snout covered by warts. Behavioral traits of Bushpigs are quite interesting to observe. Bushpigs are quite lazy by nature. They are territorial and tend to protect their domain possessively. These animals are nocturnal and this trait is believed to be closely related to the surrounding temperature. Interestingly, during the colder winter months they are more prone to be active during daytime. They mostly choose dense vegetation as a place for shelter and build their nests during cooler periods. One of the most favorite activities of Bushpigs involves wallowing. They often follow the fruit-eating monkeys and feed on uneaten fruits that fall from the trees. Sometimes they also eat small crops. They can move around within a distance of 0.5 kilometers to 5 kilometers in a day. Bushpigs are highly social creatures and mostly prefer to stay in groups or sounders consisting of up to 12 individual pigs. Among every single group of Bushpigs a dominant male and female will reign over other females and young ones. Bushpigs are omnivorous creatures. Their diet mostly includes crops, rhizomes, roots, tubers, bulbs, fruits, carrion, insect larvae and newborn lambs. They also like to eat several invertebrates and smaller vertebrates. The agricultural crops that they have developed a taste for in recent past include potatoes, tomatoes, maize, sugar cane and some other vegetables. 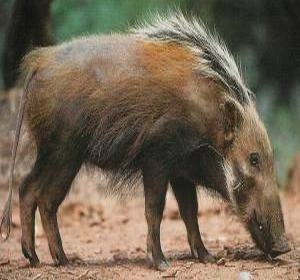 Bushpigs are found in many locations across Eastern and Southern parts of Africa including Ethiopia, Somalia and Congo. They are also seen in the KwaZulu-Natal and Cape Province of South Africa. Bushpigs have been recently observed inhabiting some islands of Indian Ocean such as the Comoros archipelago and Madagascar. These creatures like to inhabit different types of natural habitat zones such as montane forests, woodlands, forests, grasslands, reedbeds, river vegetations, swamps, scrubs and even well cultivated areas. Bushpigs are mostly being preyed by lions, leopards, caracals, spotted hyenas and pythons. Bushpigs are widely adaptive and they are well capable to accustom themselves to varied climatic conditions. Their wide range of food preferences ensures they never face dearth of food. If predators are nearby, they will make a prolonged, resonant growl which can alarm the surrounding fellow-beings. They have poor eyesight but they compensate for this drawback with their exceptionally good smelling and hearing power. Bushpigs mate from the months of May through the end of June. Bushpigs practice a polygynous mating system. The male Bushpigs do not allow other males to interact with his chosen group of females. There is strong competition among males for female attention. The males fight among themselves by butting their heads and shoving their foreheads. The Bushpigs breed once annually. Female Bushpigs give birth mostly before the beginning of monsoon, between the months of September and November. The females generally move to a hollow or sheltered nest while giving birth. The gestation period generally last for 120 to 127 days. Females give birth to 1 to 4 offsprings but sometimes the number can increase up to 6. The females wean the young ones for around 2 to 4 months. The males play an important role in taking care of the young ones and protecting them from intruders to their nests. Bushpigs can grow aggressive when they produce offsprings. The parents generally drive out the young ones when they are about 6 months old.These mammals reach sexual maturity at around 18 to 21 months of age. The average life span of Bushpigs is about 20 years. Bushpigs are listed in the “Least Concern” category by the IUCN. Here are some interesting facts about the Bushpigs. Bushpigs play an important role in the dispersion of seeds in the forest areas where they live. In African countries, the influence of Islamic religion and its prohibition on pork consumption has provided the Bushpigs a good deal of protection from being hunted and consumed. 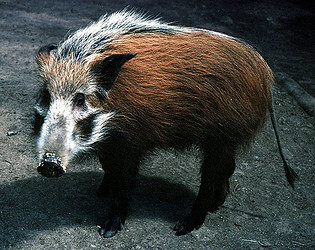 The Potamochoerus larvatus is closely related to another pig species, Potamochoerus porcus, or the red river hog. Both these species are referred to as Bushpigs by some sources. Interbreeding between these two species is a frequent occurrence. The Bushpigs are provided special legal protection in Burundi. These mammals are nocturnal by nature but still during winter months they become active in daytime. Here are some pictures of Bushpigs. is there a specific habitat bushpigs have to mate in?